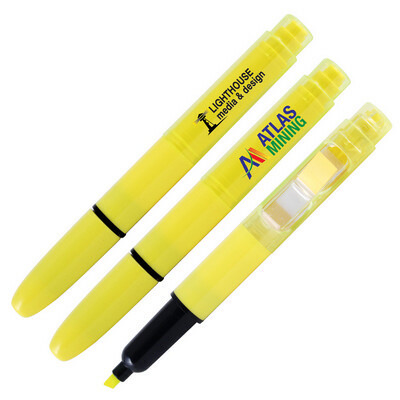 Highlighter pen with yellow note flags in barrel. Highlighter has yellow Ink. Colours - Yellow/Black Size - 138mmL x 15mm Dia. Decoration Area(s) - Pad Print : Barrel - 25 x 8mm (LxH), Behind Note Flags - 35 x 8mm (LxH); 4CP Digital Direct Print : Barrel - 25 x 8mm (LxH). Price includes : 1 Col 1 Pos Print. Setup is included.